Utility giant Duke Energy has moved into wind power and has found that small projects can indeed be beautiful with Happy Jack, a 29.4 MW project in the wind-rich state of Wyoming. Duke Energy is certainly well known for large power projects, and big power production-it supplies and delivers electricity to approximately four million U.S. customers, and has a massive 35,000 MW of electrical generating capacity in the Midwest and the Carolinas. Even though Duke Energy ranks as one of the largest power utilities in the United States, the company has found that when it comes to wind power projects, small can indeed be beautiful-and working with smaller communities can work out really well, too. While Duke Energy currently has several larger wind power projects on the go-the 90 MW Notrees and 58 MW Ocotillo projects, both in Texas-the company recently wrapped up work on a smaller wind farm, the 29.4 MW Happy Jack project near Cheyenne, Wyoming. 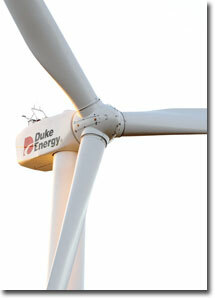 And this $55 million project has worked out well, reports David Marks, senior vice-president of wind energy for Duke. "It's been a great project," he says. "We worked directly with the City of Cheyenne and they're extremely happy with how Happy Jack has come together and how it has turned out." The City of Cheyenne is a major participant in the project, having leased close to 750 acres for the Happy Jack wind power site (the unusual name comes from the nearby Happy Jack Road). The city will receive royalty payments for the use of the land. Things are well in place for the off-take. The wind-generated power is going to Cheyenne Light Fuel & Power, a subsidiary of Rapid City, South Dakota-based Black Hills Corp., under a 20-year agreement. The power will essentially be used locally, in Cheyenne and the surrounding area. There's no doubt that wind power in the United States has achieved a new level of critical mass. It's doing so well that the American Wind Energy Association's flagship show, Windpower 2009, was sold out of exhibit space almost a year in advance-and actually had to be moved to accommodate additional exhibitors. Originally scheduled to be held in Minneapolis, the show is now being held in Chicago at McCormick Place, from May 4 - 7, 2009. Duke Energy's David Marks says it's little wonder the industry is doing so well. "If we have a goal of achieving 20 percent from renewable energy, and we are hovering around one percent now, we have a long way to go. This industry has many, many years of growth ahead of it." Marks-who has attended many Windpower shows-says he saw one indication quite a few years back that the wind power industry had come of age. Marks, who used to be involved with the oil business, says he realized that the industry was starting to develop some real depth when he saw the same bankers and lawyers that he used to see at oil and gas events, at the Windpower shows. "It's become a deep and very fast growing business. Some people thought that wind power was for the Birkenstock crowd-but that's long gone." Duke's involvement with Happy Jack actually started in 2007 when it purchased Tierra Energy, a leading wind power development company located in Austin, Texas. The purchase included more than 1,000 megawatts of wind assets under development in the Western and Southwestern United States, including Happy Jack. Even back then, the Power Purchase Agreement was well advanced, as was a turbine supply agreement with Suzlon. A total of 14 of Suzlon's S88-2.1 MW wind turbines were used on Happy Jack. "All the elements for the project were in place when Duke purchased Tierra," explains Marks, who was Tierra Energy's president, and joined Duke Energy. "It's a great site, with a good wind resource," he adds. "The fact that we had a lease with the City of Cheyenne meant that we would probably have good local support for the project which, in fact, has been the case. And being able to sign a long-term PPA made it extremely attractive." Following several community meetings, the company went through a local review process for the wind project and received the necessary approvals. "We had some good strong community support, including from some adjacent landowners," says Marks. The City of Cheyenne was very on side with using green power. And even though the state has extensive coal mining operations that produce coal for use in power generation in other states, Wyoming Governor Dave Freudenthal also supports clean energy, and wind power projects. "Generally, there's a lot of support for wind projects in this part of the country," says Marks. "People view them as clean, domestic sources of energy, but they also see them as economic development projects that help the community. They certainly help the tax base of a community." Marks says the Happy Jack project is one of Duke's smaller wind power projects, but he adds such modest-sized wind projects are an important part of the industry's mix. The company will soon start work on an additional Wyoming wind farm, the 99 MW Campbell Hill wind power project near Casper, early in 2009. "As we go through our wind power development into the future, Happy Jack will be on the smaller end of the scale. But 30 MW is not an unusual size for a wind project. Given the land that we had available, we've made the best use of it to produce that 30 MW." It also seems to be a good use of the site itself, since it is next to a large, recently closed, city-owned landfill. "In addition to having outstanding wind qualities, with good steady wind in that part of the state, it's aesthetically pleasing-you'll have the wind turbines on rolling hills next to a grassed-over landfill." With the acquisition of Tierra Energy, Duke Energy showed that it was serious about getting a stake in wind power-and it recently reinforced that intent. "We came to Duke with a pipeline of projects, and we're continuing to add to that pipeline through our regular development process. And we'll ramp things up further with the acquisition of Catamount-it will add significantly to that pipeline." In a $240 million deal, Duke acquired Vermont-based Catamount Energy in September. The Catamount acquisition includes 300 megawatts of renewable energy already in operation, including an interest in the Sweetwater project in Nolan County, Texas-one of the largest wind projects in the world. Duke Energy will also gain approximately 1,750 megawatts of development interests in several U.S. states and the U.K. through that acquisition. Marks expects the integration of Catamount into Duke Energy will go well-as has been the case with the acquisition of Tierra Energy. It has also created some significant synergy, he adds. "Even though Duke had not built a wind power project, they have people who are highly skilled and experienced in the construction of energy projects. We have been able to greatly benefit from that internal capability." A good illustration of this is that of the three projects Tierra had on the go when it was acquired by Duke, all had been completed within 18 months. "I think that's good testament to the fact that the skill set is there at Duke, and they were able to ramp it up quickly on wind projects." The companies complemented each other, says Marks. "The skills we brought from Tierra Energy were more on the finance and development side, rather than the construction side." There could be one heck of a lot more wind power in Wyoming's future, in addition to Duke Energy's Happy Jack and Campbell Hill projects. A recent major study, The West's Renewable Energy Future, concluded that Wyoming-produced wind power has the greatest potential for providing the Western U.S. with a reliable source of clean, alternative electricity generation. The study stated that wind-generated electricity produced in Southern Wyoming and delivered through a large-scale trans-mission system is the most viable option for meeting the clean power demands of the rapidly growing Desert Southwest (Arizona, Nevada and Southern California). 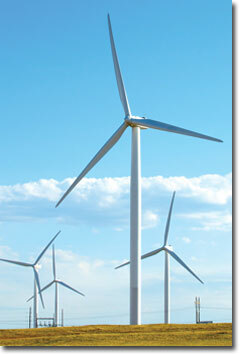 The National Grid study concluded that the best wind sites in the West are located in Southern Wyoming. A NREL report says that this region has over 50 percent of the best-quality wind in the entire U.S.
A characteristic of Tierra, and which continues with Duke, is a strong focus on the off-take side, and on having projects as contracted as possible. Long-term Power Purchase Agreements are the way to go, they believe. "One of our distinguishing features is that we have high quality, long-term off-takes with our projects, and that's going to continue." biggest company in wind power." Geographically, Duke has been focused on the Western U.S., though it has one project under development in Indiana. But Marks notes that will change somewhat with the acquisition of Catamount, which has a project planned for Pennsylvania, as well as planned projects in the U.K. In terms of future growth and projects, Marks says that while there have been challenges for the industry on the wind component supplier side, he believes significant growth is still achievable. "It's been said that turbine availability drives this business, and I think that's still true to some extent. But what we have done is diversified our turbine supply base and now have three different suppliers. "I think supplies have improved-certainly in turbines there are more market players than there have been in the past. The established companies have also clearly ramped up production and, in some cases, become more focused on the U.S. market. My feeling is that it's easier to initiate discussions about additional supplies right now than it has been in the past." The City of Cheyenne is a major participant in the 29.4 MW Happy Jack wind power project, having leased close to 750 acres for the site of the project. The site is next to a large, recently closed, city-owned landfill. Big picture, and on the legislative front, Marks says he shares the frustration over the sometimes constant battle over the extension of Production Tax Credits-but the industry has to look beyond PTCs. "We support PTCs, but I don't see that as a long-term solution," he says. "I think Congress will begin to address a national renewable portfolio standard. If and when that happens, I think that will eventually take the place of PTCs and will drive, to a large extent, the development of renewable energy sources. "Production Tax Credits make for fits and starts in this business, no question about that," he adds. "But at Duke, we have taken such a strong position in some cases, with respect to projects and turbine purchases, that we have gone beyond the termination of PTCs." With Happy Jack completed, Duke's efforts in Wyoming are now focused on the Campbell Hill project and the different challenges that project will bring. And large or small projects, there are always challenges, says Marks. "Obtaining the land, having the turbines, and off-take agreements are critical, but transmission can be the real difficult piece. That can be the main issue on almost every project." In Texas, for example, there is a tremendous wind resource, there are not any significant permitting regulatory issues, there is a good amount of land available, and a growing demand for power. But the largest single issue remains transmission capabilities. While Happy Jack was certainly a successful project, Marks notes there are benefits that come from scale, such as with their larger Texas projects. "For Duke Energy, would I say that we would tend to build bigger projects in the future?" suggests Marks. "I'd say yes to that, but you have to remember that you are limited by the land that you can lease, the wind that is available, transmission and turbine availability, and what your off-taker is looking for. There really are a lot factors to take into consideration." Generally, there are advantages to doing projects in the Western U.S., in that large parcels of land can be leased dealing with just one or two landowners, he adds. Duke's Notrees project is 17,000 acres and involved a relatively small number of landowners. "We can get sites that large and only have to deal with five or six landowners." That is a significant contrast with other areas of the country, such as the more densely settled and populated states. "In the northeast, you may have to deal with a couple dozen landowners, and by the time you put it all together, you might be lucky to get a 30 MW project. It all depends on the project and its location." That said, 30 MW, as in the case of Happy Jack, can be the ideal size, Marks concludes.